Two polls are out tonight, the daily YouGov one for The Sun and one from Harris for Metro,Â report opposing movements in the Tory lead. Harris has a 10% margin, up three points on their last poll a little over a week ago,Â whereas YouGov has the lead drifting down a point from seven to six since yesterday.Â That’s not necessarily contradictory because of the differing time periods and relatively small movements. With the election only days away from being called there’s a boost for the Lib Dems in the latest PB/Angus Reid poll. The entire field-work took place yesterday and today and so was completed after Monday’s Channel 4 “Ask the Chancellors” debate. A big feature in this latest poll is a sharp decline in the proportion going to others. This follows a period when AR was recording the biggest shares – that is now down to one of the lowest. Labour also move up to their highest recorded level since AR started their UK polls last October. This is how AR use operate their campaign polls in Canada where the firm has had great success. I’ll update this post with the link to the detailed data when that becomes available later tonight. This is not rocket-science and many PBers will know this already but I thought a guide to how to fix simple online polls might be timely. No doubt we’ll see a deluge of them in the next few weeks and the more people know how they can be fiddled the less notice that will be taken of them. It really is quite simple. The most insecure polls simply leave a cookie on your browser when you have voted. If you can delete that then you can vote again and again and…………………. 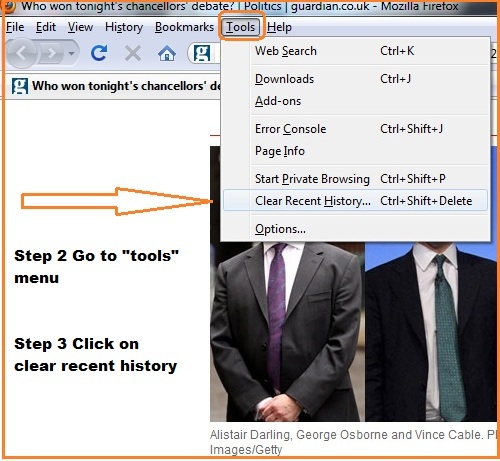 The browser featured is Firefox though you can do this easily using IE, Chrome and Safari. All you do is find out how to delete cookies. What’ll this do to the final week of the campaign? Could opinion harden against a hung parliament? 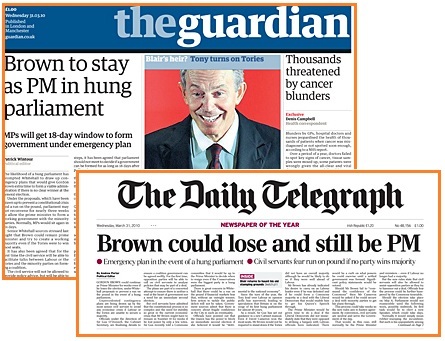 Both the Guardian and Telegraph lead on a civil service plan that would have Mr. Brown remaining at Number 10 in the case of a hung parliament. Without getting into detail of the constitutional niceties isn’t this going to add to what’s been called the “Hung Parliament paradox” – the more it seems likely the less likely it is to happen? For the experience of 1992, when the polls had the parties neck and and neck, was a hardening of the Tory vote that gave John Major another five years as PM. Then, of course, it was the incumbent government that benefited maybe because Major was enjoying a significant lead in the approval ratings over Kinnock. This time could it be the opposition? It might for as we’ve highlighted in recent weeks Mr. Brown still has huge negative approval numbers. Both YouGov and Ipsos-MORI have this in the low 60s. The only occasion when a PM won an election with negative numbers like that was Tony Blair in 2005 – but he was facing an opposition leader who was even more unpopular. 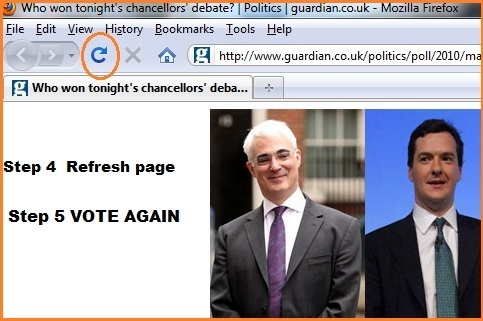 Currently YouGov have Cameron with a net ten point positive while MORI have this at even. The Ladbrokes Tory majority price has tightened to 8/13 while NOM is at 13/8. Other bookies are in the same area. So a bit of a disappointment for the Lib Dems after last night’s performance by Vincle Cable in the debates but at least they are moving up a notch. The Tory=Labour splt just the same so no notoiceable change following the big NIC announcement. There is a possiblity of a Harris poll overnight for the Metro. What’ll be the impact of the return of Tony? Can his intervention help Labour turn the tide? So he’s back nearly three years after he stepped aside to let Mr. Brown become leader and PM. What’s going to be the impact? Can Tony turn some of those Tory voters who went Labour in 1997 and have now moved away? Or has his influence on the UK scene declined the longer he has been away. There are also the controversial reports of his earning as an ex-PM. But Blair, whatever you think of him, can be a persuasive speaker and there’s nothing he likes more than being centre stage. There is a danger that his lucidity and confidence when in the spotlight might not contrast very well with his successor. I always thought that Labour was totally dumb to oust their three times election winner but I’m not so sure what he can do now. How good at prediction are the politics dons? John Rentoul writes a post on his blog about the recent Manchester academic conference when all those making predictions said it was going to be a hung parliament. This has prompted me to dig out this MORI poll of nearly 300 politics dons taken in October 2006 only nine months before Mr. Brown became prime minister. 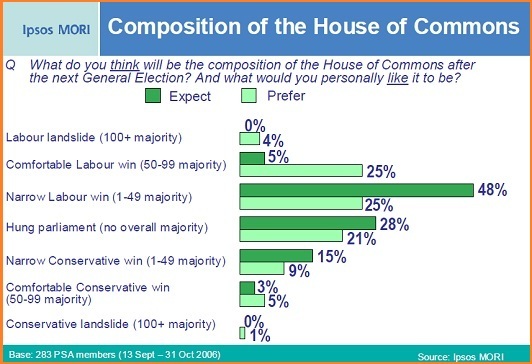 Remembering that this was October 2006, they were asked to give their forecast for the general election. Notice in particular what the personal preferences of the dons were. At the time this survey was carried out, October 2006, Populus was reporting that Cameron’s Tories would have an 8% lead if he was facing a Labour led by Brown. The standard voting intention findings that month from the firm had the gap at just one percent. At the time I was arguing strongly that the “named leader” findings were a better guide to the election outcome than the standard voting intention numbers. 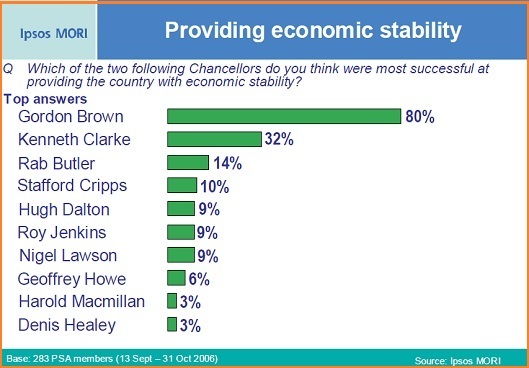 Others questions about the role of chancellors and in one they were asked to rate which post-war Chancellor had done most to bring economic stability. 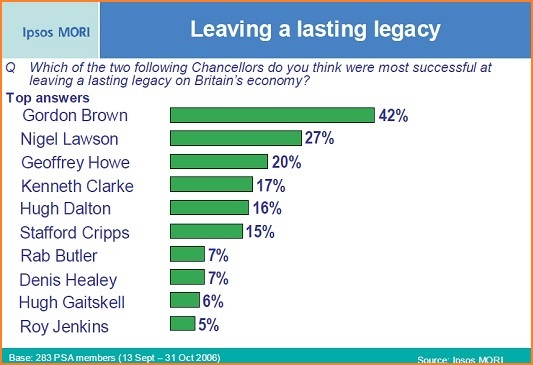 Another slide contained the responses in relation to economic legacy. But will it affect voting in the marginals? And what are we to make of voodoo polls? 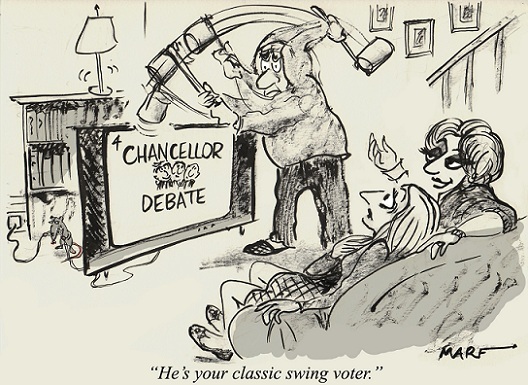 Thanks to PB’s cartoonist Marf for her take on last night’s debate and her gentle reminder that the group that really matters are swing voters. So who won and what impact will it have? Beware of the voodoo polls – not only are the samples self-selecting but it’s very easy to multi-vote as I discovered last night after recording my preference in Channel 4’s quickie poll. 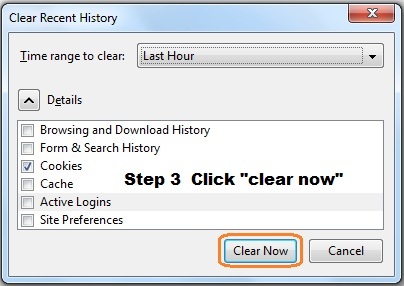 A message then appeared that I could only vote once – something that was over-ridden by going into “Tools” on the Firefox browser menu and clicking the “clear recent history” option. If there has been an impact then it will be seen in the next round of proper polling which we’ll get in the next few days. The view of most pundits was that Vince Cable, as expected, performed best and was the only one to get repeated applause from the studio audience. This will do the Lib Dems no harm though I do worry that Vince, the super TV personality, is developing into his own “separate brand” which might not be doing his party as much good as perhaps it might. As had been predicted Osborne started with very low expectations but survived reasonably well – though his whole persona does not come over on the small screen. His real skill, and why he is so dangerous, is in identifying opportunities like the one on NI contributions and finding the rhetoric to exploit it. Maybe the Tories should let others do the talking. Darling’s low-key manner worked reasonably well and he managed to interject on a number of occasions without being over-aggressive or rude. He looks like a decent man wrestling with massive challenges to do the right thing. He didn’t do his party any harm. In the betting Ladbrokes tightened its price on a Tory majority to 8/13, from 4/6 – a change reflected elsewhere. This is also being helped by the improved Tory poll ratings. The cartoon is by PB’s Marf – more of her work can be found at LondonSketchBook.com.